One week to the day after the U.S. presidential election, 31-year-old serial entrepreneur and angel investor Gerard Adams and I wrapped up an hourlong discussion at the Newark offices of Fownders, his four-month-old, Newark-based startup accelerator, with a discussion about what initiatives like his mean in the new reality Americans from coast to coast were still coming to terms with: that of Donald J. Trump as the country’s president-elect. I explained to Adams that many of the people in my personal and virtual networks seemed to be stepping through a similar process en masse, one that had begun on election night with despair and now, a week out, had wound up at a place of vigilance and resolve: what can we do, people in their various spheres of influence were asking, to move vulnerable communities forward in the wake of a Trump presidency? I’d asked Adams how he thought about this question from his position as a successful entrepreneur with the resources necessary to create a startup accelerator, which is a company that provides very early-stage businesses with the resources to get on their feet. His personal answer: find strength in our ability to create business opportunities, and specifically in the ability of startup entrepreneurs to create wealth and jobs. “I truly believe Newark is the most exciting place in the country right now, but economic development is not just about creating buildings and bringing cool places and quality venues to town. It’s about building people–you have to create jobs,” said Adams. “And the only way we’re going to have real GDP growth and job creation is to support new businesses,” he said. He thinks Fownders, whose bright and slick offices are situated in a residential neighborhood in Newark’s Central Ward, can do just that, helping Newark to become the “Silicon City” of the East Coast. The first time I met Adams was about two weeks prior. We were both attending a press conference in 2 Gateway Center to announce the launch of Newark Fiber, a new initiative meant to position the city as a promising tech company destination on the strength of its hyperfast and competitively priced internet connectivity. 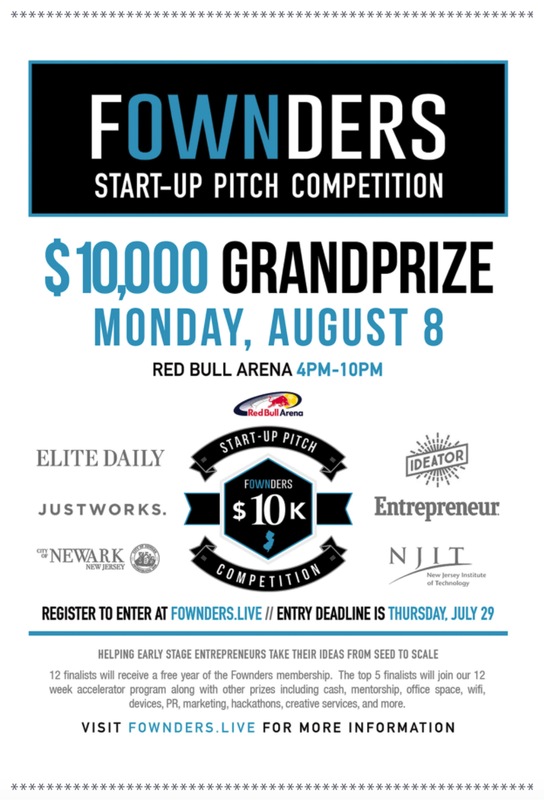 When Adams introduced himself as the founder of Fownders, the name immediately rung a bell: I’d started receiving notifications about their events from personal acquaintances and local tech groups in mid-July of this year, and had marveled that Fownders came seemingly from out of nowhere in July, only to hold a $10,000 pitch competition at Red Bull Stadium in early August. Now that I was face-to-face with Adams, with his hair slicked back and sharply clad in a grey suit and purple tie, Fownders’ quick ascent made sense. Adams was the cofounder of Elite Daily, the Millennial-focused website which he and his parters sold to The Daily Mail in 2015 for $48 million dollars. Adams was a successful young entrepreneur who had lived the “startup comeup” story, and he had the means, experience, access to expertise and knowhow to come to Newark, his father’s hometown, and attempt to create the conditions for other entrepreneurs to achieve success on a similar scale. Two weeks after meeting Adams, I visited the Fownders offices to check it out for myself. The building, which Adams had built from the ground up, sits at the corner of Norfolk Street and Sussex Avenue, in a residential neighborhood at the crossroads of young Newarkers’ walking commute to school. Fownders’ floor-to-ceiling windows let passersby see right inside from the street, into what could easily be mistaken for an art gallery. What they’ll find on closer inspection is a classic tech accelerator scene: casually clad young people meeting in groups of twos in threes, or huddled over their computers in intense concentration, hard at work trying to build the next successful tech startup. Looking down on them are gigantic and colorful paintings of Thomas Edison, Albert Einstein, Steve Jobs, Mark Zuckerberg and Shaquille O’Neal. When Adams bounded downstairs to meet me for our interview, full of energy despite just having taken a red-eye back from Los Angeles, it took me a split second to recognize him. Gone were the suit and slick hair, in its place jeans, sneakers, a t-shirt and a Thrasher hat turned backwards. He’d seemed perfectly comfortable in the suit; he seemed downright at home in the skater gear. I had read during my pre-interview research that Adams is not a fan of small talk. True to that description, he dove right in. “I wanted to create a place where people could build, innovate, and learn from each other. As you can see, there’s one door in, one door out,” he told me, motioning towards the building’s entrance. Adams said he modeled the space on Building 20, a storied edifice at Massachusetts Institute of Technology that birthed a diverse set of innovations, including high-speed photography, modern linguistics, the first Bose speaker, single-antenna radar and the physics behind microwaves. Some owe the number of innovations created there to the serendipitous, interdisciplinary brainstorming that took place at Building 20. Fownders was architected, Adams said, so that “everyone bumps into each other,” fostering the kind of random, unplanned debate that helps innovators make the most out of being in close quarters. Fownders was built from the ground up at the corner of Norfolk Street and Sussex Avenue. Above, use the slider to compare the block before and after. But unlike the fictional Bachman, Adams is no obnoxious “tech bro.” He’s sincere and relentlessly positive, his conversation often bordering on motivational speech, both in tone and in content. He talks often of sharing, of action, of greatness, inspiration and possibility. Don’t be surprised to leave a conversation with him feeling charged. Part of that is clearly personality driven, but his real life startup story pushes his pronouncements beyond the realm of platitude. Adams grew up next door to Newark in Belleville, and described the younger version of himself as just an average kid. “I wasn’t the smartest kid,” he said in recent TEDx talk at NJIT. In fact, he said, he was often “looked at as a troublemaker” who went against the grain. That tendency animated the decision during his first semester of college to drop out and learn how business works by joining the working world. “I wanted extraordinary success,” he said, and college “didn’t feel right” as the path to achieve it for him. So while his peers attended their college courses, Adams went to work in public relations for a small-cap investment firm, and then struck out on his own to offer similar services for more of those types of companies through his own agency. By age 24, Adams had become a millionaire, but those spoils were short-lived: the stock market crash of 2008 wiped out much of his newfound fortune. In a bid to pick up the pieces and create something useful from his own misfortune, Adams started creating content to educate his peers about the economy. One of his interns at the time proposed the idea for Elite Daily, and he and a small team built it into a Millenial-targeted digital property that grew to draw tens of millions of unique visitors each month. But when Adams sold Elite Daily to The Daily Mail, he admitted feeling some angst over letting go of his creation and fearing that he might have sold the site for less than it could have commanded. The idea to build a startup ecosystem in Newark helped him to shake off that funk. Adams, who by that point had been named to Business Insider’s list of New York-area founders “Under 35 and Crushing It,” had been steeping himself in the world of startup incubators and was being invited to give talks all over Silicon Valley, said he wanted “to get out there and show people that an average kid from Jersey can do this.” Fownders would offer aspiring entrepreneurs the lessons, frameworks and mindset Adams said he wished he’d had access to when he was starting out more than a decade ago. By the time I visited Fownders, their first cohort of ten startups was already nine weeks into their 12-week program, and there were less founders onsite than there would typically be. 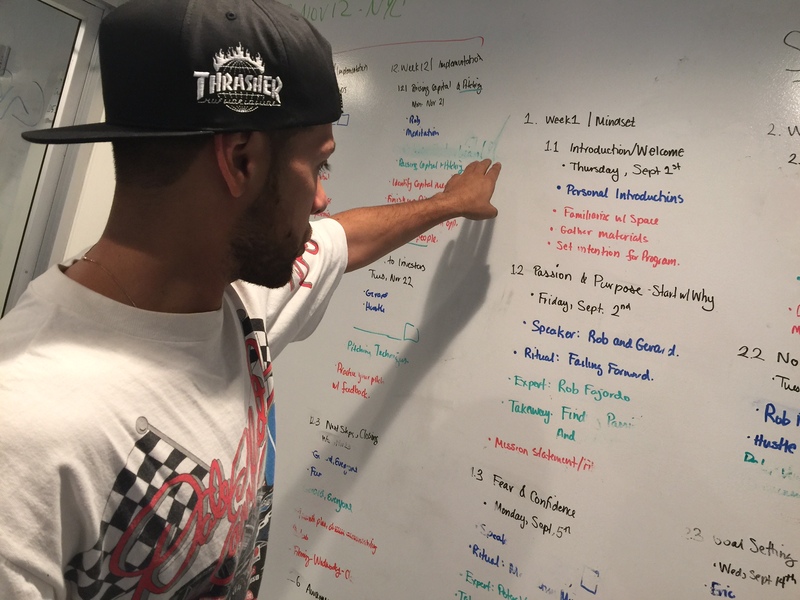 One of Fownders’ key assets is Adams’ curriculum, which is handwritten in painstaking detail on a whiteboard in the second floor workspace. It spans business concept development to marketing, selling and customer acquisition. “The first six weeks are grind mode,” Adams told me. Now at two months in, many of the founders were doing their work outside of the building, getting advisors and even pitching investors. When they “graduate” from the program, they should have a well-conceived and tested product, network of mentors and peers who can provide ongoing supponort, and access to the capital and partnership opportunities that can help them to scale and sustain their businesses. A typical day at Fownders involves the entrepreneurs talking about their business models and plans, having mentorship sessions in a small conference room on the first floor, and listening to a steady parade of experts straight out of Adams’ contact list give talks and workshops about entrepreneurship topics. The founders start every morning with a “ritual”–a motivational speech, physical workout or “ultra reading” from the business and leadership books in their small library–and participate in a “failing forward” meeting every Friday to discuss obstacles and think through how to overcome them. Drawing positive lessons from failure is a hallmark of entrepreneurial thinking today, and Adams himself attributes his success to analyzing and rising above perceived failures throughout is career. Half of companies are being built by Newark-area founders, according to Adams, and the other half include principals from around the country. Among them is Blastchat, created by Jhamar Youngblood, which promises to deliver the most important news to the palm of users’ hands via push notifications sent their mobile phones’ lock screens. Newark college students are working on Youii, best understood as an Uber-style service for city college campuses for which both the passengers and drivers are exclusively students. Newark native Jade Jordan, whose biography is “one of the most inspiring stories I’ve ever met,” said Adams, won Fownders’ pitch competition in August with an idea for a goal-setting app, named Arize Alarm, that requires users to type daily affirmations each morning in order to stop their mobile phone alarms. North Carolina native and lifelong football player Jared is working on Oskie, an app that will be like Slack for athletes, streamlining communications between team members, coaches and staff. Founders of color are notoriously underrepresented among recipients of startup venture capital. According to a statistic from Pitchbook cited on Fownders’ website, one out of three startups that raised a Series A round of funding in 2015 had graduated from an accelerator like Fownders. Logic would have it that creating more accelerators that target Black and Latinx founders can help increase the pipeline and grow the number of successful startups. Adams’ curriculum is meant to help early-stage founders refine their ideas, hone their business models, build their “founder mindset” and ultimately feed them into programs like Y Combinator, 500 Startups, and Newark Venture Partners, the $50 million venture capital fund housed at Audible headquarters. Those types of programs and venture funds are meant to help grow companies even further, but entrepreneurs need to already have built some traction in order to get into them, including anywhere from $25,000 to $100,000 in seed capital, said Adams. “We have to work to think of creative ways to create founders” in terms of getting them access to early-stage capital, he said, so he’s considering building an equity crowdfund specifically for Fownders Newark entrepreneurs. 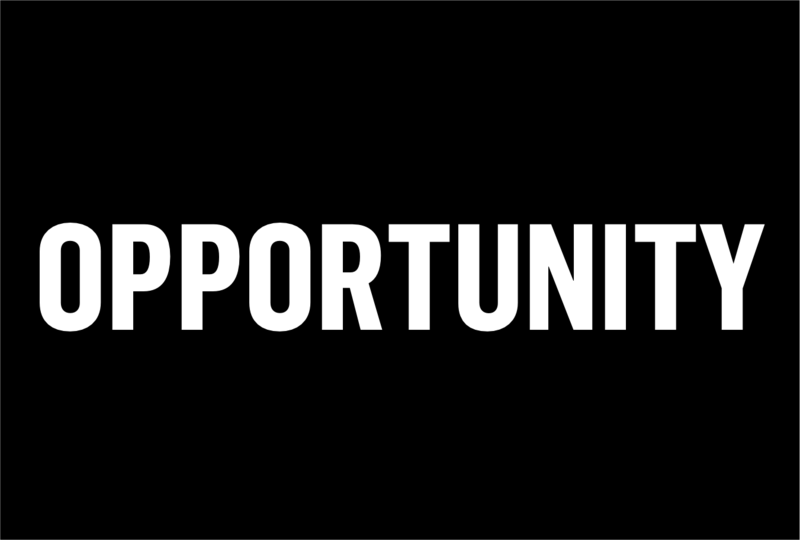 An equity crowdfund leverages Title III of the JOBS Act, a law that went into effect on May 16th of this year, which allows ordinary people who contribute to a business through a crowdfund take an ownership stake in it. Such a tactic would increase the potential sphere of success for Fownders startups beyond companies and their employees to everyday people who decide to invest. 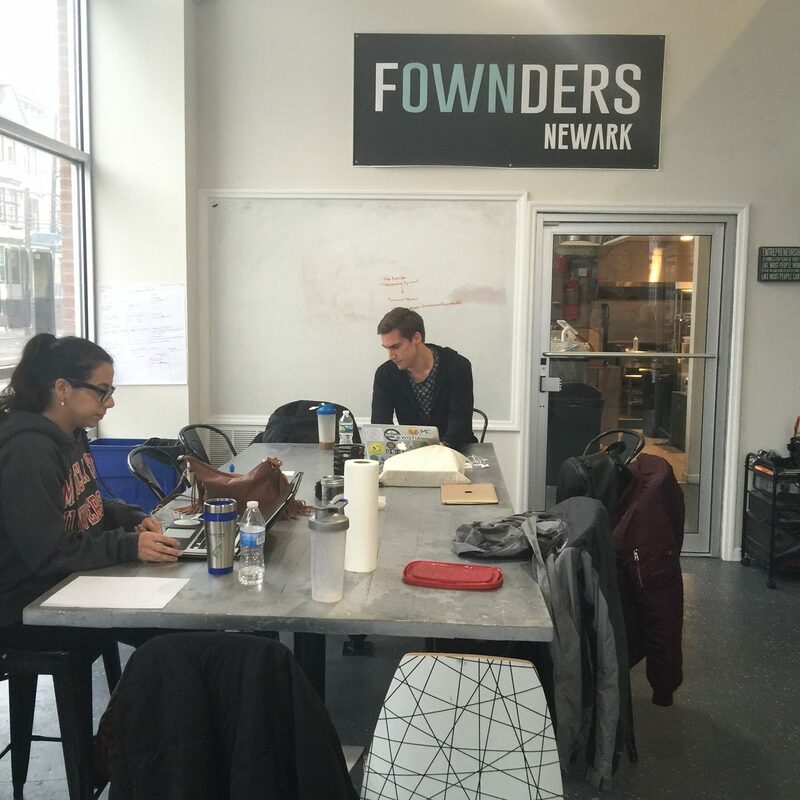 Adams is already thinking about expanding Fownders, and is toying with the idea of setting aside a small percentage of crowdfunding pledges to build Fownders accelerators outside of Newark. “I get emails all time asking me to open a Fownders in other cities,” said Adams. If he ultimately decides to go that route, said Adams, “I’d donate my intellectual property, mentorship network and digital platform to empower locals to build a Fownders in their own community,” and create a “franchise division” responsible for traveling from city to city to help local entrepreneurs get their own Fownders started. According to Adams, Fownders’ currently has more than 60 applications for their next cohort of companies and are looking for more. In 2017, Adams said he is hoping to engage more with local youth, who he calls Future Fownders. He envisions partnering with local schools to help figure out what kids’ dreams and passions are, and then connecting them with Fownders’ mentors and companies to test out new technologies and talk to business-minded people about what’s possible for their own futures. And Adams, who is of Italian and Venezuelan descent, wants to engage more local people of color to help attract more entrepreneurs into the fold and serve as mentors. When we met, he was looking forward to a meeting later in the day with Newark native Anthony Frasier, a successful entrepreneur in his own right and cofounder of Brick City Tech. “It would’ve been easy to go downtown [with Fownders], but I really wanted to be ingrained” in the community, Adams said. 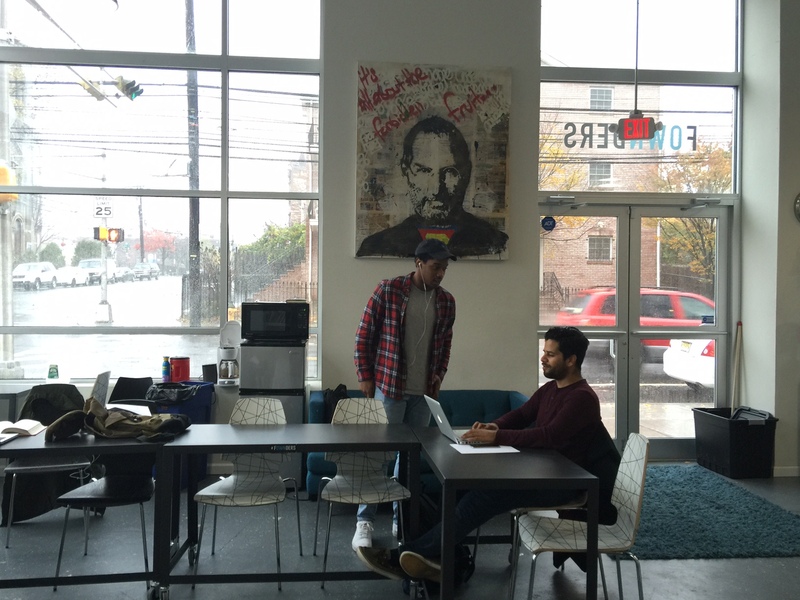 Aside from actively incubating startups, Adams believes in the power of proximity. Jade Jordon, the pitch competition winner, was a walk-in, he said. So too is a Shabazz High School student named Shakur, who Adams has been mentoring personally. 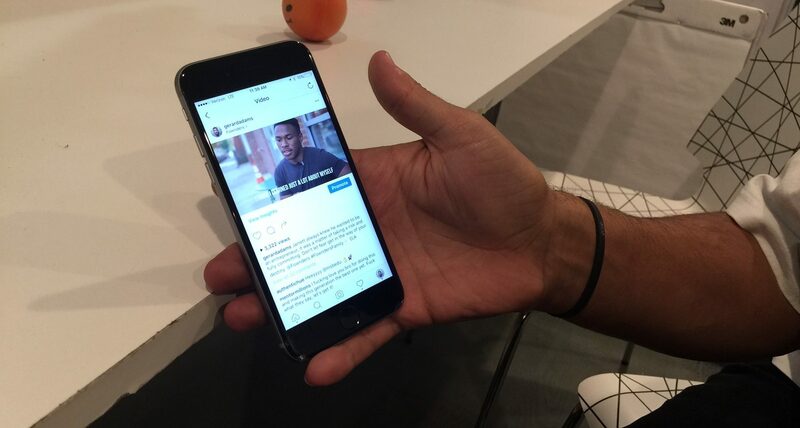 His interaction with Shakur, in partucular, is helping Adams avoid the fallacy of seeing all upside in Newark from his vantage point as a well-resourced tech entrepreneur. Shakur had been stopping by Fownders and being inspired by what went on there, said Adams. But a few months of business inspiration won’t overcome some of the serious obstacles the young man is facing in his personal life. Adams thinks a youth focus will be key to moving the city forward, but recognizes other gaps that are beyond the scope of his current, Millennial-focused mission. “By being immersed in a residential community, I want to awaken both parents and their kids to these types of opportunities,” said Adams. He said he’d like Fownders to host community events and invite parents to become aware and be involved, especially because the parents are often looking for opportunities, jobs and want to learn new skills themselves. Adams and his plans embody a necessary component of Newark’s bid to become a tech and entrepreneurship hub. A city can facilitate infrastructure, as it did with Newark Fiber, but it’s a lot tougher to generate a genuine startup culture from municipal activities. Rather, it makes more sense for people like Adams, whose bailiwick is startup creation and mentorship, to bring their expertise to bear on creating opportunities for technology entrepreneurs, with the city playing the role of facilitator, connector and marketer. “If I were to go back to the 18-year-old Gerard, what would be an environment that I would want to cut my learning curve in half to get me to success?” he said. Every business he created was to solve a problem he faced, and he wants to help entrepreneurs traverse the space between the spark of an idea and successful, sustainable enterprises that create jobs. To find out more about Fownders and learn how to apply, visit their website at Fownders.com.